The Northern Forest Canoe Trail links the waterways of New York, Vermont, Quebec, New Hampshire and Maine. The route is divided into 13 sections, and each section has its own map with both route and interpretive information. 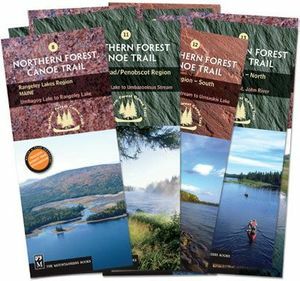 The waterproof, tear-resistant maps include boat access, campsites, campgrounds, dams, portages, rapids, and waterfalls, as well as local contact information, permit guidelines and fascinating information about local history, wildlife, geology and more. Receive one FREE when buy this map set!